218 pages | 15 B/W Illus. This is a wonderful, lucid and scholarly exploration of the new opportunities for the conduct of an artful sociology that is vital and publicly engaged. The way Lambert links live sociology with debates about performativity and the queering of live sociology is brilliant and really pushes this cluster of methodological practices and ideas into new and exciting directions. 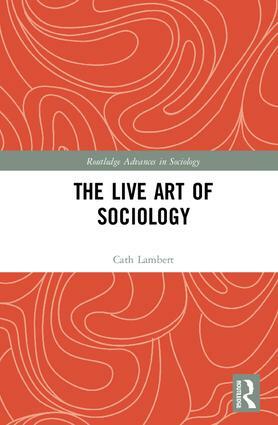 Cath Lambert has given us a treasure trove in The Live Art of Sociology, brimming as it is with intellectual resources and real-world examples that breathe fresh life into sociological aesthetics. By encouraging us to recognise and stay with the discomfort that comes from uncertainty and not-knowing, this beautifully written and generative work opens sociological thinking and methodology to the affective, haptic and other sensual registers of the social world. With queer feminist politics at its beating heart, The Live Art of Sociology is the book so many of us have been waiting for. An animated, insightful, witty and ethically provocative companion. Lambert offers us something both generative and representative "…an ethics of beholding and accounting for what we see, hear, feel and understand from our research encounters." …This is a very personal, theoretical and methodological route to live…Lambert here shows us how [live art sociology] engages, challenges, entertains and, most of all, imagines. Cath Lambert is Associate Professor of Sociology at the University of Warwick, UK.